OBJECTIVE To determine whether a patient education programme (PE) would improve rates of adherence to a slow acting antirheumatic drug and to assess any subsequent effect on patient outcome. METHODS A randomly controlled study comprising 100 patients with rheumatoid arthritis (49 control CG; 51 experimental EG) requiring d-penicillamine (DPA). The same practitioner saw patients on seven occasions, for the same length of time. The EG received 7 × 30 minute one to one sessions of PE, while the CG received standard management. The primary measure of adherence was a pharmacological marker (phenobarbitone) encapsulated with the DPA assayed at monthly intervals for six months. Plasma viscosity (PV), C reactive protein, articular index, morning stiffness, and pain score were used to assess outcome. RESULTS 454 blood samples were collected and assayed and the pharmacological marker showed the EG to be significantly more adherent on more occasions than the CG (p<0.05). Patterns of adherence over time showed that at 12 weeks 86% (38/44) of those in the EG compared with 64% (29/45) of the CG remained adherent (p=0.01). These trends continued and by the end of the study 85% (29/34) of the EG compared with 55% (23/42) of the CG were taking their DPA as prescribed. Fifteen patients (12 from the EG) experienced side effects requiring study withdrawal and 14 patients requested study withdrawal (two from the EG). On study entry patients in the CG had significantly higher levels of PV than the EG and this remained so throughout the research. However, on completion, the health status of patients in both groups had improved significantly (p<0.01). CONCLUSIONS PE significantly increased adherence to DPA and its effects persisted over a period of six months. No additional clinical benefit was detected in the EG in comparison with the CG. Musculoskeletal diseases account for over 50% of the six million physically disabled adults in the United Kingdom.1Approximately 4% of patients are referred to a hospital department, but the remainder are managed in the community.2 These patients constitute 18.7% of all general practitioners' consultations.3 Rheumatoid arthritis (RA) is one of the most serious of these diseases with rates of morbidity and mortality equal to those caused by malignancy.4 They also exact a major personal and financial toll on the patient and their families through pain, disability, reduced self esteem, and loss of income. The total cost of the disease to the UK has been calculated at over £1 billion a year.5 Although RA is incurable, there is some evidence that slow acting antirheumatic drugs (SAARDs) decrease the progression of joint damage, decrease inflammatory synovitis, and increase physical function, and this effect is enhanced if they are given in the early stages of the disease.6 However, these drugs are thought to be effective only if the patient adheres to long term treatment and this does not always appear to be the case. Published reports quote a range of drug adherence levels from 16% to 84%,7-9 and studies of the SAARDd-penicillamine (DPA) using objective techniques have reported non-adherence levels of 42%10 and 39%.11 Further research is needed into interventions that improve drug adherence. Patient education (PE) is an integral part of the successful management of rheumatic disease,12 defined as any set of planned, educational activities designed to improve patients' health behaviour and/or health status.13 Research has shown that PE can bring about improvements in health status,14-16 and many health professionals believe it to be the key to improved adherence. However, few studies have explored the effect of PE on drug adherence and none has employed objective techniques. This study was devised to test the hypothesis that PE would enhance the rate of adherence of patients with RA to their SAARD. The chosen intervention was a PE programme taught by a rheumatology nurse practitioner, conducted from the busy outpatient clinic of a university teaching hospital. The study was a randomised controlled design comparing an experimental group (EG) receiving a full programme of PE with a control group (CG). The CG received standard management and were provided with a drug information leaflet alone. Where practicable, variables that could confound the results were eliminated. All patients took the same SAARD, were given the same number and length of appointments, and were seen by the same rheumatology nurse practitioner. Referrals to other members of the multidisciplinary team were deferred until study completion, as were treatments such as intramuscular and intra-articular injections of steroid. An independent blind assessor carried out all clinical assessments. Withdrawal criteria were (a) any patient who requested withdrawal was immediately removed from the study; (b) decisions on withdrawal from the trial owing to adverse drug events were made by an impartial observer (HB), who was unaware of the group allocation. The EG received a comprehensive programme of PE based on the theory of self efficacy: a person's confidence in their ability to perform a specific task or achieve a certain objective.17 Patients who exhibit a high degree of self efficacy believe that they can make a positive difference to their own health. The programme comprised information about the types of drugs used for RA, the disease process, physical exercise, joint protection, pain control, and coping strategies. Written information, including a DPA drug information leaflet developed specially for the study, was provided as back up. All patients were seen by the rheumatology nurse practitioner for a 30 minute appointment at monthly intervals over a six month period comprising seven visits. Patients in the intervention cohort received their PE, and the control group was invited to talk about their social lives and families, ensuring equity of consultation time. Patients were asked about side effects. To reduce any researcher bias they were asked a standard question “Have the tablets upset you at all?” If the patient answered, “Yes”, they were asked “In what way?” Further information was gathered by use of a standard check list that included questions alluding to known adverse effects of DPA. The independent assessor determined efficacy by carrying out clinical assessments and collecting pain and stiffness charts. Venepuncture was undertaken to monitor any drug side effects, disease activity, and adherence. The study was granted ethical approval. The rheumatologists referred 100 patients with active RA from the outpatient clinic at Leeds General Infirmary to the research team. All were deemed to require DPA as their SAARD. RA was chosen as it exhibits natural cycles of disease activity even when patients adhere to their drug treatment. DPA was selected as it is slow to act, taking on average 12 weeks before the patient feels any efficacy. It also exhibits many of the traits cited by patients as being least desirable in a drug.8 These factors ensure a rigorous test of adherence. Entry criteria required that all patients were aged 18 years or above, had a positive diagnosis of RA using the American Rheumatism Association criteria,19 a plasma viscosity (PV) ⩾1.75 mPa.s or a C reactive protein (CRP) >10 mg/l. In addition, they should have two out of three clinical features: an articular index >15, morning stiffness >45 minutes, a minimum of moderate levels of pain. Patients were excluded if they had received DPA previously, had a contraindication such as kidney impairment or pregnancy, or were receiving incompatible concomitant drugs. Patients who were awaiting hospital admission were excluded as the nursing staff often give drugs during their stay. The independent assessor invited patients to take part in the research but did not mention PE or adherence. Patients were advised that their DPA would contain a small dose of phenobarbitone to assess the efficacy of the drug. All patients agreed to participate. It has been suggested that former educational level is a predictor of prognosis, behavioural variables, and knowledge of disease.20 Patients were therefore stratified into bands of low, medium, or high knowledge of their RA by means of a validated patient knowledge questionnaire.21 Patients in each band were allocated to the EG and CG using a separate computer generated code for each band. This was done to ensure that the two groups had comparable levels of initial knowledge. Allocation was carried out by a clerk who had no study input or patient contact. The primary measure of adherence was by pharmacological marker, a technique used successfully in rheumatology10 and other areas.22 23 The dosage of DPA was 125 mg daily for the first two weeks, 250 mg at weeks 3 and 4, 375 mg weeks at 5 and 6, and 500 mg thereafter. Phenobarbitone (2 mg) was encapsulated with each 125 mg and 250 mg of DPA in a standard capsule, resulting in a dose of 2 mg daily for the first four weeks, and 4 mg thereafter. At this dose there is no apparent sedative effect and little interindividual and intraindividual variation.24 Its four day elimination half life means that steady state concentration is reached only after about two weeks of regular ingestion. Taking a few doses immediately before a clinic appointment presents as non-adherence. Plasma phenobarbitone concentration was measured by high performance liquid chromatography at each clinic visit.24 The ratio of phenobarbitone level in the blood to prescribed dose (LDR) was calculated for each patient at each study visit: (phenobarbitone concentration (mg/l))/(daily phenobarbitone dose (mg/kg body weight)). Because the formula relates phenobarbitone concentration to drug dosage, it takes into account the variation in drug dosage during the first six weeks of taking DPA. Adherence was assessed by two methods. All the available LDR data collected from each group was aggregated and a test of significance was applied. This method provides an overall picture of drug ingestion within each of the groups but takes no account of any cumulative effect of PE on adherence. The data were then stratified into its longitudinal components to determine if there were any significant differences between the groups at each time point, and to scrutinise patterns of adherence within the groups. When analysing the results using method 1, data from patients who were withdrawn owing to side effects and those who withdrew themselves were treated in exactly the same way. However, the definition of adherence adopted for the research renders those patients who stopped taking their drugs at their own volition, non-adherent. Conversely, patients whose drugs were stopped by the “blind” impartial observer because of potentially serious side effects were merely “coinciding with medical advice” and therefore should not be classed as being non-adherent because of their study withdrawal. When a patient left the study for any reason, all the LDR data collected while they remained in the study was included in the analysis. Patients who withdrew themselves from the study without being advised to do so were classed as being non-adherent at subsequent planned visits, even though no LDR data were available. Patients who were withdrawn from the study by the impartial observer were excluded from the figures in the weeks subsequent to withdrawal as there were no LDR data and it was not possible to predict their adherence behaviour after removal. Outcome was assessed by two biochemical methods—PV and CRP, and three clinical assessments—articular index (AI), morning stiffness, and pain score. The data were not normally distributed and therefore all comparisons were made using non-parametric statistics. A χ2 test was used to determine differences in adherence between the EG and CG. Between-group comparisons were made using the Mann-Whitney U test, and within-group changes by the Wilcoxon matched pairs test. A logistic regression analysis was performed to highlight any significant variables affecting adherence. The significance level of 5% was adopted. One hundred patients were randomly allocated to the two groups, resulting in 49 in the CG and 51 in the EG. As expected with RA the majority were female (39 CG, 34 EG). Ages ranged from 34 to 79 years in the CG and 22 to 74 years in the EG, median 62 and 63 years, respectively. Many had had their RA for a considerable period: median duration in the CG was 12 (0.33–45) years and in the EG 13 (1–37) years. Few patients had entered higher education and most had left school aged 15 years. Sixty three patients completed the full 24 weeks of the study, 30 CG and 33 EG. Only six patients in the EG and 12 in the CG did not experience some type of adverse drug effect, fortunately the majority were mild. Of the 37 patients who dropped out of the study, 15 (3 CG, 12 EG) were withdrawn by the impartial observer owing to potentially hazardous side effects (table 1). Fourteen patients either requested withdrawal or ceased taking their DPA on their own initiative (12 CG, 2 EG) and their reasons and any side effects they experienced are given in table 2. The characteristics of these patients were no different from the remainder of the cohort, and a number showed clear signs of therapeutic improvement (table3). In addition, seven patients were admitted to hospital for reasons unrelated to the research (4 CG, 3 EG) and one patient from the EG died of a coronary thrombosis. Over the course of the study a total of 236 LDR samples were collected in the EG compared with 218 in the CG. Of this difference, 12 are accounted for by the unequal cohort sizes, the remainder were lost samples. From the available sample, 32 (14%) indicated non-adherence in the EG compared with 42 (19%) in the CG. The CG was adherent on fewer occasions than their counterparts, and these differences reached levels of significance (p<0.05). The LDR data were then stratified into its longitudinal components (table 4) and the corresponding month by month changes in adherence show distinctly different patterns for each cohort (fig1). Levels of adherence over a six month period—analysis 1. *Difference significant at the 5% level. After the first four weeks of DPA, the CG was adherent on more occasions than the EG, but at week 8 there was little difference. Subsequent weeks showed the EG becoming more adherent, peaking at 95% (2/38 non-adherent) at week 16 and then levelling off at just above 90% until study completion. By contrast, the CG became less adherent over time, and by week 24 had reached a low of 77% (7/30 non-adherent). Differences between the groups reached significance at week 16 (p=0.05) and although this trend continued, differences just failed to reach significant levels at weeks 20 (p=0.09) and 24 (p=0.06). The data were then reanalysed as described earlier in method 2 (table 5) and the corresponding month by month rates of adherence were calculated and plotted (fig 2). Again, distinctly different patterns of adherence emerge. Patients in the CG maintained over 80% (37/45) adherence at week 4 compared with 76% (35/46) in the EG (p=0.375; NS). By week 8 the situation had reversed and 78% (36/46) of the EG compared with 72% (33/46) of the CG were adherent (p=0.451; NS). This pattern of increasing adherence continued in the EG, peaking at week 16 at 90% (36/40) and then reverting to 85% for the remaining weeks. 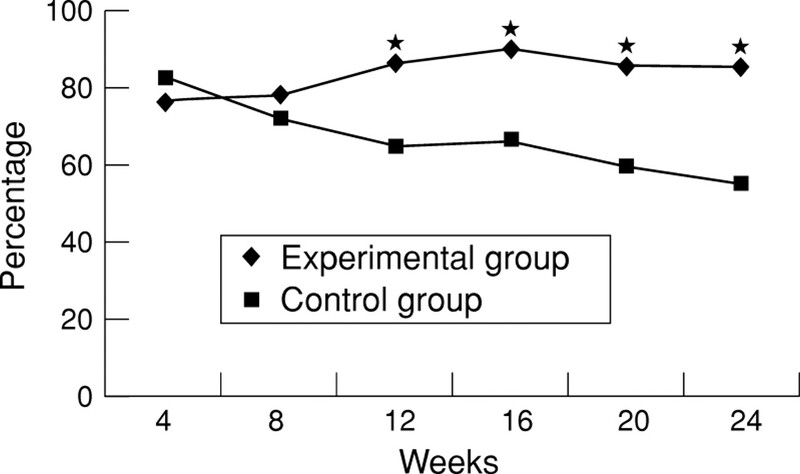 By contrast, the CG became less adherent and reached a low of 55% (23/42) by week 24. The difference between the groups became significant at week 12 (p=0.01) and continued to be so throughout the remainder of the study (week 16, p=0.01; week 20, p=0.02; week 24, p=0.01). Levels of adherence over a six month period—analysis 2. *Difference significant at the 5% level. Individual adherence was very uneven, with many patients taking drugs holidays during the study. In one patient in the EG drug levels were detected on only one occasion, and this was at a very low dose. A patient in the CG had taken no drugs by week 4 and then took only very small doses throughout the remainder of the study. Three patients, two in the CG, one in the EG, took low doses on 5/6 occasions and two in the CG and one in the EG took low doses at 4/6 data points. Although PE increased adherence in the EG, there was no additional improvement in clinical outcome. Both cohorts had active RA on study entry (table 6) with raised levels of PV (CG 1.91; EG 1.83) and CRP (CG 72; EG 63). Between-group comparisons showed that the CG had significantly higher entry levels of PV than those in the EG (p<0.05). Both groups responded well to DPA, indicated by falling levels of PV (1.81 CG; 1.70 EG) and CRP (39 CG; 25 EG). Within-group comparisons (Wilcoxon rank sum test) showed these improvements to be highly significant in both cohorts (p<0.01). There was no significant difference between the groups on completion of the study in CRP (p=0.55; NS), but with the exception of week 4, PVs remained significantly higher in the CG (p<0.01). The clinical assessments mirrored the improvements in the biochemical data and again on completion there were no significant differences between the groups (table 6). A stepwise forward conditional logistic regression analysis was performed, in which baseline characteristics were regressed against the dependent variable: adherence/non-adherence. The only variables in the final equation with p<0.05 were the patients' group allocation and AI. Patients in the EG who received a programme of PE were more likely to be adherent than those in the CG, and patients with a high AI were less likely to be adherent. The primary finding from this study is that patients with RA who received a planned programme of PE during their consultation with a rheumatology nurse practitioner, demonstrated significantly increased adherence to their SAARD treatment compared with the CG by all methods of analysis used. The CG were adherent on fewer occasions, both when the LDR was used alone (analysis 1) and when patient self withdrawal was taken into account (analysis 2). Group allocation was one of only two variables to be found to be significant by the logistic regression analysis. In most of the adherence research reported to date, levels of adherence fall over time and this occurred in the CG. Over the 24 weeks of the study, adherence rates fell from an initial 84% to 77% (analysis 1) and 82% to 55% (analysis 2). This latter figure is consistent with other studies using objective techniques.10 11 By contrast adherence in patients in the EG improved. With analysis 1, 76% were shown to be adherent at week 4 with a maximum of 95% at week 16. By week 24, 91% of patients remained adherent. Analysis 2 showed 76% of patients to be adherent at week 4, 90% at week 16, and thereafter the figures remained consistently at or above 85%. It has been suggested that patients with active disease are more likely to comply with their drug treatment,26-28 and in this study active disease was a prerequisite for the administration of DPA. However, both groups were clinically and biochemically active and so this was not a confounding variable. The incidence of drug related side effects may also influence adherence and many patients experienced adverse reactions. Only six patients in the EG and 12 in the CG did not experience some unwanted effect. Despite this, patients in the EG were reluctant to withdraw. Indeed three patients who were withdrawn owing to hazardous side effects requested to stay in the PE programme. It is also noteworthy that four times as many patients in the EG (12) as in the CG (3) experienced serious unwanted effects requiring withdrawal of DPA. Possibly, this was owing to higher rates of adherence in this group. By contrast, the number of patients requesting withdrawal was far higher in the CG (12) compared with two in the EG. Although PE improved adherence to SAARD treatment, as in other studies this enhanced adherence did not produce measurable additional beneficial clinical outcome.28-30 Possibly, a composite index for disease activity might have been a more sensitive indicator to detect any difference between the two groups than the single variables used. Both groups benefited from taking DPA both biochemically and in all clinical parameters. Although the accepted wisdom is that DPA needs to be taken regularly to maintain its therapeutic effect, there is some evidence that intermittent treatment can produce similar results.11 Consequently, although patients may not adhere to their DPA regimen exactly as prescribed, this may not be clinically important because variable adherence may sustain response over a six month period. The choice of the pharmacological marker used in this study provides quantitative data and confirms drug ingestion, but does not supply information about the dynamics of adherence. However, for the purposes of this research it is felt the method can be justified on three counts. Firstly, the dynamics of ingestion of DPA would add little to the overall picture as it is a once daily dosage and can be taken at any time of day. Secondly, the measurement of DPA directly is difficult and its pharmacokinetics could not have provided similar information.34 35 Furthermore, the long half life of the marker enabled us to measure adherence over a number of weeks, which is pertinent to SAARD treatment. Researcher bias is another potential problem in that the rheumatology nurse practitioner who managed all patients and provided the PE programme was not blind to group allocation. However, bias was minimised by ensuring that clinical assessments and all data collection were undertaken by the blinded observer and decisions on withdrawing patients from the study were made by an impartial observer who was unaware of the patients' group allocation. Although this study indicates that PE has an advantageous effect on drug adherence, greater adherence failed to show any significant additional clinical benefit. Possibly, the large number of withdrawals made it difficult to detect relatively small additional benefits, and further studies using larger patient numbers are required. PE is a method of bringing about behavioural change; simply imparting information does not achieve this. The PE programme used in this study can be used in almost any setting, but the one to one method used in this study is relatively expensive. Work from America and other countries has shown that group PE based on the arthritis self management course led by specially trained lay teachers who have arthritis is effective.36-39 This type of PE requires further exploration in conjunction with objective techniques to measure drug treatment adherence. We thank Robbie Harmer who acted as the blinded assessor, Michelle Bradley for her assay expertise, Ann Cross for clerical assistance, Paul Astin for statistical advice, and the pharmacy department of Leeds General Infirmary. (1988) The prevalence of disability among adults. OPCS surveys of disability in Great Britain. (HMSO, London) (Report 1. OPCS Social Surveys Division.). (1994) Health care needs assessment for musculoskeletal diseases: the first step—estimating the number of incident and prevalent cases. (Arthritis and Rheumatism Council for Research, Newcastle) . (1979) Department of Health and Social Security. Morbidity statistics from general practice. (HMSO, London) (2nd National Morbidity Survey 1970–71.). (1993) Early rheumatoid arthritis. Rheumatol Pract 1:10–12, . (1996) The cost of rheumatoid arthritis. Br J Rheumatol 35:781–790, . (1997) Treatment of early rheumatoid arthritis patients with slow-acting anti-rheumatic drugs (SAARDs). Baillieres Clin Rheumatol 11:65–82, . (1984) A critical review of compliance studies in rheumatoid arthritis. Arthritis Rheum 27:1227–1233, . (1992) Patient non-compliance: deviance or reasoned decision-making? Soc Sci Med 34:507–513, . (1989) Adherence with treatment regimens among adult rheumatoid arthritis patients: current status and future directions. Arthritis Care Res 2:S33–S39, . (1988) The use of a pharmacological indicator to investigate compliance in patients with a poor response to antirheumatic therapy. Br J Rheumatol 27:381–384, . (1993) The long-term use of d-penicillamine for treating rheumatoid arthritis: is continuous therapy necessary? Br J Rheumatol 32:614–617, . (1995) The co-ordinated care of the rheumatic patient—a nursing perspective. Rheumatol Europe 24(suppl 2) 292–299, . (1996) Patient education—a practical approach. (Sage, Thousand Oaks), p xiii, . (1987) Arthritis patient education: a review of the literature. Patient Educ Couns 10:207–252, . (1994) Arthritis patient education studies, 1987–1991: a review of the literature. Patient Educ Couns 24:9–54, . (1995) Psycho-educational interventions in the treatment of arthritis. Baillieres Clin Rheumatol 9:803–823, . (1977) Self-efficacy: toward a unifying theory of behavioural change. Psychol Rev 84:191–215, . (1948) A new readability yardstick. J Appl Psychol 32:221–233, . (1988) The American Rheumatism Association-1987. Revised criteria for the classification of RA. Arthritis Rheum 31:315–324, . (1988) Formal education level—a marker for the importance of behavioural variables in the pathogenesis, morbidity and mortality of most diseases. J Rheumatol 15:1457–1460, . (1991) The development and use of a patient knowledge questionnaire in rheumatoid arthritis. Br J Rheumatol 30:45–49, . (1991) Measuring compliance in methadone maintenance patients: use of a pharmacological indicator to “estimate” methadone plasma levels. Clin Pharmacol Ther 60:199–207, . (1988) Measuring treatment compliance of men with non-gonococcal urethritis receiving oxytetracycline combined with low dose phenobarbitone. Genitourin Med 64:312–315, . (1989) Measurement of low (subtherapeutic) phenobarbitone levels in plasma by high-performance liquid chromatography, application to patient compliance studies. J Chromatogr 497:308–312, . (1979) Introduction. in Compliance in health care. eds Haynes RB, Taylor DW, Sackett PL (John Hopkins University Press, Baltimore) . (1997) Compliance in rheumatoid arthritis and the role of formal patient education. Semin Arthritis Rheum 26:707–710, . (1985) Determinants of compliance in rheumatoid arthritic patients assessed in their own home environment. Br J Rheumatol 24:313–320, . (1998) Effects of patient education with basic treatment regimens and health in recent onset active rheumatoid arthritis. Ann Rheum Dis 57:146–151, . (1999) Effect of antidepressant drug counselling and information leaflets on adherence to drug treatment in primary care: randomised controlled trial. BMJ 319:612–615, . (1999) A 12-month randomized controlled trial of patient education on radiographic changes and quality of life in early rheumatoid arthritis. Rheumatology 38:303–308, . (1989) Compliance measurement with arthritis regime. Arthritis Care Res 2:S8–16, . (1991) Compliance with drug therapy. J Clin Pharmacol 32:535–539, . (1997) The electronic medication event monitor—lessons for pharmacotherapy. Clin Pharmacokinet 32:345–356, . (1984) Dose plasma concentrations and response relationships to d-penicillamine in patients with rheumatoid arthritis. J Rheumatol 11:772–775, . (1982) Pharmacokinetics of reduced d-penicillamine in patients with rheumatoid arthritis. Arthritis Rheum 25:111–116, . (1993) Arthritis self management: a twelve year review. Health Educ Q 20:17–28, . (1998) Long-term outcomes of an arthritis self-management programme. Br J Rheumatol 37:1315–1319, . (1995) A five-year follow up of a controlled trial of an arthritis education program. Br J Rheumatol 34:647–652, . (1993) Group education for patients with rheumatoid arthritis. Patient Educ Couns 20:177–187, . Contributors: JH designed the protocol with help from HB who also acted as the impartial observer. SJ carried out the phenobarbitone assays. The manuscript was prepared by JH and commented on by all authors. Funding: Arthritis Research Campaign and Northern and Yorkshire R&D Directorate.